For patients with hearing problems, we have a loop hearing system available at reception and for use in consulting rooms. There are a small number of disabled parking spaces at the front of the medical centre and additional dedicated spaces at the side of Aldi Supermarket (opposite the medical centre). Please do not park on the road. Our surgery is accessible to patients using a wheelchair. Automatic doors have been installed to access the surgery and consulting room corridor. 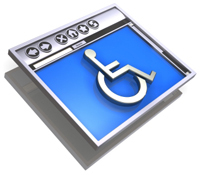 A toilet for wheelchair users is available, please ask at reception.